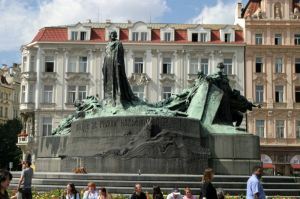 Protestant – every day's a holiday! Behold! the angels said, ‘Oh Mary! God gives you glad tidings of a Word from Him. His name will be Christ Jesus, the son of Mary, held in honour in this world and the Hereafter, and in (the company of) those nearest to God. Today we celebrate Jesus Christ’s 2011th birthday. We don’t know the year Jesus was born. But it’s believed he was born at least four years prior to the year we count as 1 A.D. because King Herod the Great, whom Matthew cites as king when Jesus was born, died in 3 or 4 BC. One theory for this discrepancy is that Dionysius Exiguus–the sixth century monk who created the A.D. dating system (short for Anno Domini Nostri Jesu Christi or “in the year of our Lord Jesus Christ”)–forgot to calculate the four-year reign of Emperor Octavian when adding up the years since the birth of Christ. Thus, the year he deduced to be 525 AD should have been 529. 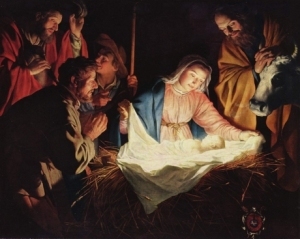 Another theory states that Jesus was born even earlier, since the census that Luke mentions as the time of Jesus’s birth [This was the first census that took place while Quirinius was governor of Syria – Luke 2:2] occurred every fourteen years. Working backward, historians figured the first census would have been conducted in 8 BC. So you see, we’re already in the future: 2019 AD. But whether we’re wishing Jesus a happy 2011th, 2015th or 2019th birthday, we’re almost certainly celebrating the wrong day. There’s no hint in the Gospels as to the day or even the season of Christ’s birth. A fact which has led some Christian denominations to exclaim that, had God wanted us to celebrate the birthday of the Lord, He would have given us some indication of the date. In 4000 Years of Christmas, Episcopalian minister and scholar Earl Count recounts that the Romans celebrated December 25 as the birthday of the Sun God Mithra, a tradition inherited from Persian Mithraism. Similarly, the Annunciation of Christ, observed 9 months earlier on March 25, coincided with the Spring Equinox, which was celebrated as the New Year in the Near East. In fact, Dionysius himself never considered the first day of the Christian era to be Christ’s birth—theoretically December 25, 1 AD—but Christ’s conception—aka, the Annunciation—on March 25. Well, regardless of how Christmas was created, it has become the de facto time to observe the principles taught by Jesus nearly 2000 years ago in a troublesome Roman backwater. Christmastime is the season of Faith, Hope, and Charity. Some Christians say they wish Christmas could last all year. Others say that Christmas’s pagan roots mean we shouldn’t celebrate it at all. I’m inclined to agree with the former. If we don’t know which day of the 365 is the real Christmas, best to hedge our bets, and make every day a holy day. The fourth Sunday before Christmas marks the beginning of the liturgical calendar in much of the Western Church. 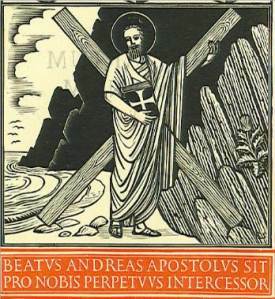 Advent Sunday corresponds to the Sunday nearest Saint Andrew’s Day (November 30). 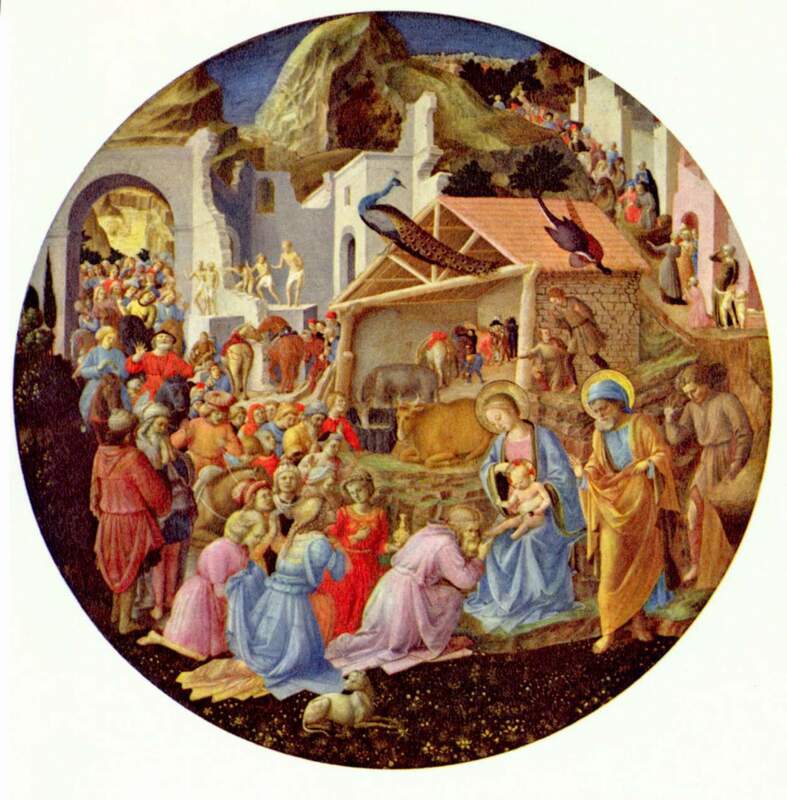 Advent comes from the Latin Adventus,meaning ‘arrival’. During Advent Christians prepare for both the anniversary the birth of Christ, as celebrated on December 25, and the anticipation of the Second Coming. The first records of what we now call Advent date from 5th and 6th century France. Advent originally lasted six weeks (43 days), from St. Martin’s Day (November 11) to Christmas, during which adherents would fast three times a week. 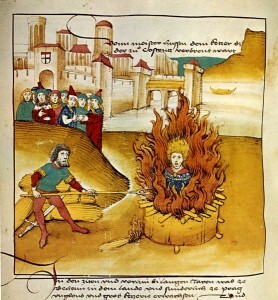 For many Germans and Austrians, St. Martin’s Day still kicks off the Christmas season. 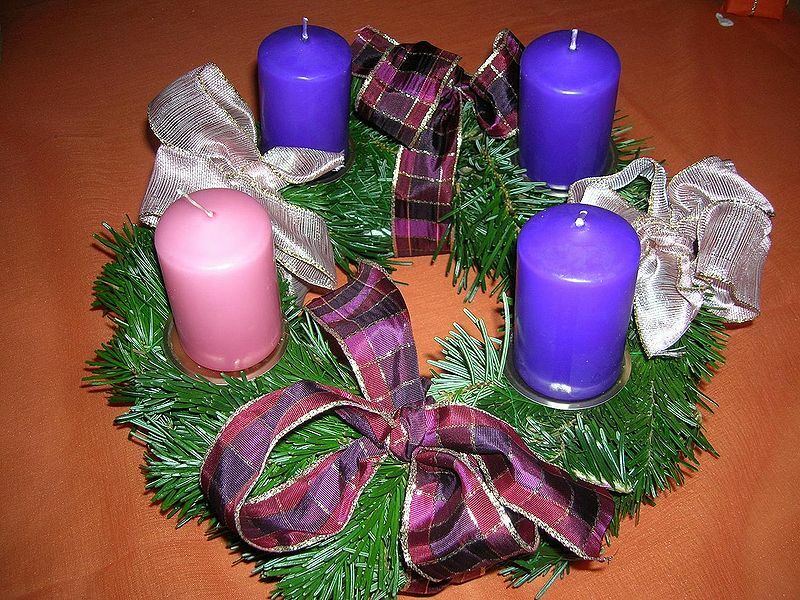 Beginning in the 9th century the length of Advent was reduced to four weeks instead of six. Over the centuries the fasting element of this “second Lent” was replaced by abstinence, which was then replaced by little calendars with chocolates in them. Some of the most visible symbols of the holiday are the Advent wreaths and the royal purple and royal blue banners and vestments in Catholic and Protestant churches. The circular wreath was an ancient Germanic and Celtic symbol, representing the ever-turning “wheel of the year”. Today the wreath–with no beginning and no end–symbolizes the eternity of God and the immortality of the soul, as do the evergreens from which the wreath is made. Laurel leaves represent Christ’s persecution; cedar represents the healing power of Christ; and pine and holly represent immortality. Pine cones are sometimes used to signify new life and resurrection. 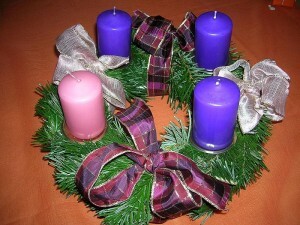 During each Sunday of Advent families and churches light one of the four wreath candles. In that respect the wreath is the original Advent Calendar. In the Catholic tradition three candles are purple. The fourth, a rose candle, is lit on Gaudete Sunday. Despite the overwhelming secular popularity of Christmas in the Western world, the big daddy of all Christian holidays is actually Easter. It’s the oldest Christian holiday and the most important. No one knows for sure how the term Easter came to be. It probably derived from Oestre, the Anglo-Saxon Goddess of Spring, Fertility and New Life. Which helps to explain why we still celebrate the resurrection with bunny rabbits and painted eggs. 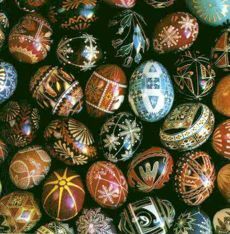 But in French, Dutch, Italian, Spanish, Swedish, and Danish, the words for Easter (Paques, Paschen, Pasqua, Pascua, Pask, and Paasske) all come from the Latin Paschalia, itself was a variant of the Greek Pascha, a term used by early Christians to refer to the even older Hebrew word Pesach, aka Passover. 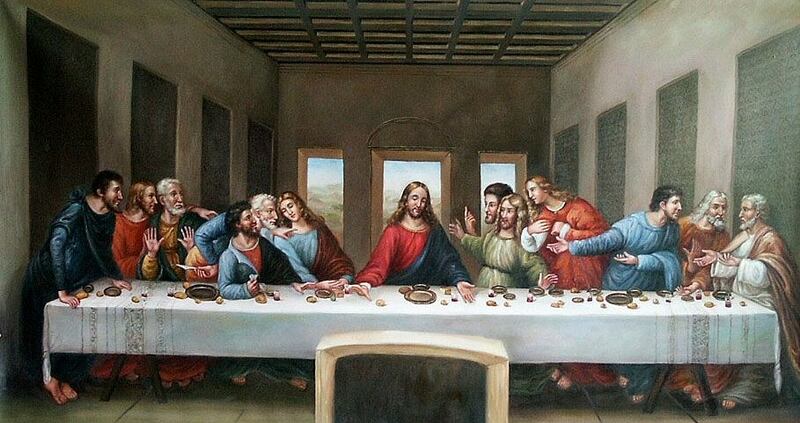 Pesach was the holiday Jesus and his Disciples were celebrating on the occasion of the Last Supper. In the United States, by far the most common method for determining the date of Easter is by scanning the Sundays in March or April for the one that says “Easter” on your calendar. This proven technique has not failed me in all my years of prognostication. But if you chronophiles want to get a little more complicated, Easter falls on the Sunday following the first full moon after the Spring Equinox. In the first centuries after Christ, Eastern Churches related the date of Easter to the Jewish holiday of Passover. Passover falls on the 14th day, or full moon, of the month of Nisan. However, since the Jews at that time used a lunar calendar the date of Passover would change in relation to the solar calendar. The Roman Church decreed that Easter should fall each year on a Sunday, and should show relevance to the solar, rather than the lunar calendar. The Roman Church on the other hand, developed an 84-year paschal cycle, which is roughly the formula we use today. The Sunday following the first full moon after the equinox. In the Roman Catholic Church’s definition, the Spring Equinox is fixed on March 21. Thus the earliest Easter could fall is March 22. The Eastern Church no longer relates Easter to Passover, but maintains that Easter should not fall before or during the Jewish holiday. Also the Eastern Church uses the actual spring equinox as measured from Jerusalem, site of the crucifixion, and follows the Julian Calendar rather than the Gregorian, adding to the complication of the dates. 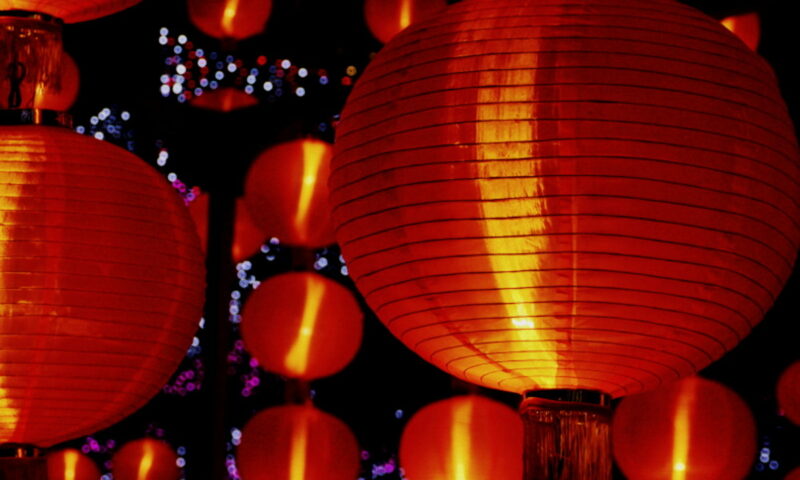 Still, Western and Eastern Easters do sometimes fall on the same date as they did on April 8, 2007. 2008 marks one of the earliest possible Easters, on March 23, only two days after the equinox. The ancient pagan traditions and rituals of spring have not only refused to die, they have become forever intertwined with the celebration of Easter. Holy Week — Now that’s a name. It makes sense. It’s holy. It’s a week. Good Friday remembers the day Christ was crucified and killed. So whoever was in charge of naming either had a morbid sense of irony or put an extra ‘o’ in God, and the name stuck. Easter, the cornerstone the Christian calendar, the celebration of the resurrection of Christ, is named, of all things, for a pagan Goddess. Holy Saturday? Okay, well that one makes sense. But what on earth is Maundy Thursday? That tradition lives on in Great Britain today, performed by none other than the Queen. No, she doesn’t wash her subjects’ feet anymore. James II, the last Catholic King of Britain, was the last monarch to do so, back in the late 17th century. These days the Queen carries on a Maundy Thursday tradition dating back to Edward I. On Maundy Thursday, the British monarch distributes specially minted coins (Maundy coins) to as many subjects of each gender as the monarch is old. 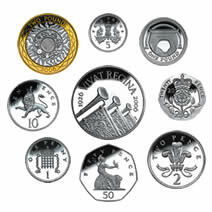 In other words, this year (2010) Queen Elizabeth, who is 84, distributes coins to 84 men and 84 women. Roman Catholic Churches on the other hand still carry on the 2000 year-old feet cleansing tradition introduced at the Last Supper. During the the Pedilavium on Maundy or Holy Thursday, the priest washes the feet of 12 selected people. The meaning of the ceremony goes back to the name Maundy. Maundy is from the same Latin root as the English word mandate, meaning “command”. 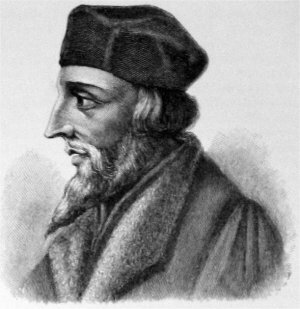 The name maundy stems from the 11th commandment. 11th commandment? I thought there were only ten? It was to be a long night. As Jesus predicted, he was betrayed by Judas Iscariot, arrested, and brought to trial. Also as Jesus predicted, Peter—who during the meal had offered to lay down his life for Jesus—denied even knowing him. All before the rooster crowed. 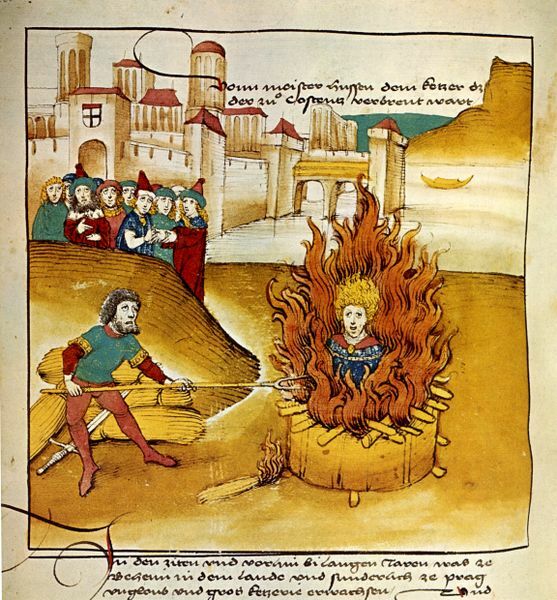 The events of what happened the following day are recounted during Good Friday.